For a minute the sheep must step aside to allow more serious matters some time. Today two pieces of news emerged, small in themselves but which may be of significance in time. The first is an announcement from the Ordinariate of Our Lady of Walsingham that Rome has issued a decree approving its liturgical use of the Revised Standard Version (RSV) – Catholic Edition of scripture, as well as approving its own proper liturgical calendar. One of the problems the broader anglophone Church had was getting copyright issues sorted out with the copyright holders of the RSV, which is a major factor in the planned use of the English Standard Version in the revised Lectionary yet to be implemented, and which I mentioned here back in December. One can only assume that either the Ordinariate has managed to overcome these issues, or that it will publish its own lectionary for use in its churches; or perhaps they have managed to get hold of a stash of the original lectionaries for the post-conciliar liturgy which were RSV, and which we still use at Douai Abbey. Whatever the reality, it is heartening to see that they will be able to use a more elegant, accurate yet comprehensible translation of scripture in their worship, and which will complement the revised Missal. Indeed, they will be ahead of the rest of us. If it turns out that copyright issues have been overcome, the question could then be asked whether the ESV will be dropped and the RSV adopted for the new Lectionary. The ESV is a revision largely based on the RSV so it will still be a massive improvement on the current Jerusalem version that is predominantly in use, and it may well be that planning is too far advanced for a change now. But this is pure speculation. … one the least satisfactory aspects of the new liturgical calendar: Ordinary Time. Before the post-conciliar reform of the Calendar the Church had no concept at all of any time being ordinary. Of course, the reformers did not intend the more banal meaning of the word to apply, but for the common Catholic it does, more often than not. All time, including that we call ordinary or “throughout the year”, is salvation time. “Now is the acceptable time” says St Paul (2 Cor 6:2), “this is the day of salvation”. In the old calendar all time was labelled in reference to one of the great moments in salvation history: Advent, the season preparing for Christmas and also for the Second Coming; Christmas; Epiphany and the days counted after Epiphany; the season of the -Gesimas, easing us out of Christmastide and preparing for…; Lent, the season of re-conversion in preparation for…; Easter and the days counted after Easter; Pentecost, the feast of the establishment of the Church as the enduring and saving presence of the Body of Christ in the world, and the days counted after Pentecost. Every day was thus anchored to salvation history. No day was ordinary, none humdrum. Every day was a call to experience more fully an aspect of our redemption, and the mystery of God’s love for us revealed in that chapter of salvation history. While the reform of the Lectionary is a far richer gift to the Church, expounding in greater detail the biblical aspects of salvation history throughout the liturgical year, nevertheless we consciously mark the time by its liturgical title, not firstly by the readings of a particular day. So, hearing a Sunday called the fifth in “Ordinary Time”, with no explicit anchorage in salvation history, will usually lead the unwary into considering that day to be, indeed, ordinary, humdrum, of no great consequence. Could that, perhaps, be part of the reason why ours has become a Church of Christmas-Easter-wedding-and-funeral churchgoers? At least those times sound special. It is a question worth pondering. So the question that must be asked here is this: with the revised Lectionary, when it comes, will there be also a revised calendar that restores the traditional way of marking liturgical time, and abolishing the fruitless novelty of “Ordinary” time? It would be wonderful if it were so. 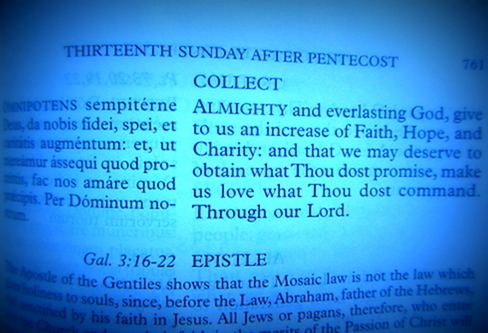 The question is precisely one of keeping “the structure desired by the Lord”, because the liturgy is a gift from God. It is not something fabricated by us men; it is not at our disposition. …. The historical panorama that Msgr. Derville offers us, even if it is —as he modestly points out— only a brief summary, is sufficient to let us glimpse areas of obscurity, that show the absence of clear data on Eucharistic celebration in the earliest times of the Church. At the same time, and without falling into a ingenuous “archaeologism”, it does provide us with enough information to be able to state that concelebration, in the genuine tradition of the Church, whether eastern or western, is an extraordinary, solemn and public rite, normally presided over by the Bishop or his delegate, surrounded by his presbyterium and by the entire community of the faithful. But the daily concelebrations of priests only, which are practised “privately”, so to speak, in the eastern Churches instead of Masses celebrated individually or “more privato”, do not form part of the Latin liturgical tradition. Moreover, the author seems to me to succeed fully when he examines in depth the underlying reasons mentioned by the Council for extending concelebration. This widening of the faculty to concelebrate needs to be moderated, as we can see when we read the Council texts. And it is logical that it should be so: the purpose of concelebration is not to solve problems of logistics or organization, but rather to make the Paschal mystery present, manifesting the unity of the priesthood that is born of the Eucharist. …. As Benedict XVI stated: “I join the Synod Fathers in recommending ‘the daily celebration of Mass, even when the faithful are not present’. This recommendation is consistent with the objectively infinite value of every celebration of the Eucharist, and is motivated by the Mass’s unique spiritual fruitfulness. If celebrated in a faith-filled and attentive way, Mass is formative in the deepest sense of the word, since it fosters the priest’s configuration to Christ and strengthens him in his vocation.” …. the limits of a right to concelebrate or not, which also respects the right of the faithful to take part in a liturgy where the ars celebrandi makes their actuosa participatio possible. This is a highly significant statement coming, as it does, from the man responsible under the Pope for the regulation of the Church’s liturgy. Just as significant is that he ties his comments closely to those of the Pope, which suggests that he is speaking with the approval, implicit at least, of Pope Benedict. Priestly concelebration has been a muddy issue since its more liberal use was allowed (before the post-conciliar reforms it only occurred at priestly ordinations). All too often it has become a means whereby a priest can say a Mass each day without much effort or organisation. As a symbol of priestly unity under the bishop, concelebration as practised today largely fails. This is because it happens even without the bishop present, and this is most of the time. And also because such unity is undermined when, as often happens here, half the priests present at Mass are not concelebrating. Is the answer to force all the priests to concelebrate? The Cardinal clearly implies it is not. He clearly acknowledges elsewhere in his paper the option for a priest to attend Mass without exercising his ministry. Yet the Cardinal’s quotation of a recent statement by the Pope, in accord with the Synod of Bishops, “recommending ‘the daily celebration of Mass, even when the faithful are not present’”, sends a clear message: the preferred and traditional practice of the Church is for a priest to offer daily the Mass, be it with or without a congregation, because, as the Pope notes, it builds and strengthens the priest’s vocation. Furthermore every Mass has a value in itself for the whole Church, for every Mass also builds and strengthens the unity of the entire Church (cf Vatican II’s Sacrosanctum Concilium, #26). If a priest has to make an extra effort to offer Mass daily as the celebrant, then surely that is a light and joyful burden that comes with ordination as a servant of Christ and his Church (and not servant of himself). The closing reference in the quote to the faithful’s right to have the manner of liturgical celebration facilitate their real and fruitful participation is worthy of note too. One might wonder if, among the issues he might have in mind, is that concelebrated Masses might often look like a clerical ‘love-in’ at which the people might feel like mere spectators. This is not the case ever, of course, in truth. Nevertheless, if even a few people sincerely experienced it as such it might point to a subtle form of modern clericalism. Perhaps there will be more to be said from Rome about concelebration and the desirability of every priest offering Mass daily. Watch this space. Two very interesting developments. I have taken the liberty of linking to this post in the combox over at the New Liturgical Movement, as your blog is the only place I’ve seen any discussion of the projected ESV lectionary, and it’s time people wised up! Thanks Ben! Like you, I am a little surprised that the new Lectionary has not been discussed more since the Archbishop of Canberra let the cat out of the bag. That said, maybe there is life in the RSV option yet. I had planned a while back to do a post comparing the translations of certain texts – RSV, ESV, Jerusalem and perhaps one other. I might yet do it! Hi. It would be really nice if you could add my blog to your blogroll. I am certainly not against reciprocal linking! Many thanks to Fr. Hugh for this facinating post. I agree with everything he says, and in this context with his posts in March and December. These are interesting times for the liturgy in the English speaking world. It now remains to be seen what will be the implications (if any) for the wider Church of the recent Decree from the Congregation of Divine Worship to the Ordinariate in England & Wales. Some people have said to me “Oh, this will probably be of little or no significance outside the Ordinariates”, but I ‘m not so sure. For one thing, any Catholic may worship at an Ordinariate Mass (if he lives near enough to an Ordinariate group), which means (presumably) any Catholic may follow the Ordinariate calendar and listen to the Ordinariate (RSV – CE) lectionary. I have often wondered why we do not make greater use of the RSV. After all, it may not be liked in some quarters, but it’s not exactly on the Index, is it ? So, for those who feel so inclined (and who live in the right area,) there need be no more “Sundays in Ordinary Time” and no more Jerusalem Bible ! Well, that’s not nothing, is it ? And we’ve not seen the Ordinariate Missal yet ! But now I want to re-read Father’s fascinating posts. There is much to ponder there. I only wish I had discovered this blog sooner. It deserves to be more widely known, and more widely read. If Rome concedes the use of the RSV to the Anglican patrimony (and it just has), then how can it refuse the use of the RSV to other English speaking Catholics. Is the RSV not part of our patrimony too ? For your positive remarks, thank you! In my very humble opinion, what happens in the Ordinariate is, to some degree, a test run for the wider English and Welsh Church. If non-Ordinariate Catholics start to attend Ordinariate Masses, Rome will take note I am sure. Rome very rarely does not think ahead and abroad. It misjudge in the process sometimes, but on matters of non-dogmatic governance it can be fallible. As I mentioned, the main obstacle to the RSV is copyright. The Churches of Christ have not been happy with the minor changes we make to fit the scripture to lectionary mode. So while the RSV was the originally-approved translation for the post-conciliar English Lectionary, one would need to find those original lectionaries (published by Geoffrey Chapman) to use it, as in fact we do here as we never converted to the Jerusalem. The RSV is still, actually approved. So the question is whether the Ordinariate have negotiated a solution over copyright, or whether they are somehow avoiding re-publishing a lectionary and making some other provision. Actually, I should jolly well ask them, shouldn’t I?! That said, the ESV, based on the RSVm is still street ahead of the Jerusalem, and being largely the work of Protestant scholars, who will allow our modifications for use in the lectionary, then we can still tick the ecumenical box as a bonus. Many thanks, Father, for that explanation. The RSV would certainly be my preferred option. That is why I am curious to know how the Ordinariate in England & Wales has got round the copyright problem. As to reprinting the old lectionary, would that be impossible ? With regard to the Ordinariate calendar, I am pleased to see that the temporal cycle is much closer to the old Roman calendar (with a dash of Sarum) than it is to the novus ordo calendar. This can only be a good thing. Of course, if they were to return to the pre-1955 calendar with an updated sanctoral cycle, that would be better still, but in light of Summorum Pontificum and Universae Ecclesiae, I rather think that possibility is, shall we say, somewhat remote ! Hi Peter. My understanding is that to reprint the RSV Lectionary would raise all the old copyright issues, UNLESS they have been resolved by the Ordinariate. No one has mentioned the Knox version, which was approved for use by the English bishops and could be printed without copyright issues as far as I can tell. It is a little idiosyncratic in parts, but has vim and verve. When I post a comparison of texts I will include the Knox, just out of interest. SP makes it clear that it is the 1962 books that must be used. To use 1955 would be tending to the smorgasbord approach to liturgy that so many of us have decried these last few years. Unlike bible translations, Pax is not under copyright, so you can use it anytime! 😉 But I am more than happy with Pax et bonum, which I wish to you as well.